The manga and anime series, Claymore, has enjoyed recent popularity due to its beautiful heroines, dark storyline, and stylistic violence. It also has a very real warmth behind it, and much of that emotion is provided through a character named Teresa. Before the present time, Teresa was the number one claymore, a female warrior who dispatches yoma, or demons. She is seemingly uncaring, as most claymore are, until she begins to grow attached to a girl, Clare, whom she saved and who follows her from place to place, even at the risk of the young girl’s own life. A grown-up Clare is the heroine of the series. Eventually, Teresa kills a group of human bandits who hurt Clare, breaking a claymore rule. Other powerful claymores are dispatched to kill Teresa, resulting in one of the most dramatic scenes in recent anime, and one which fatefully affects the entire storyline. Teresa, beautiful, violent and cool, seems to be quite different, at first, from the peaceful, locust and honey-eating John the Baptist. However, the two share several important commonalities. None is more important than their roles in relation to more important characters/people. John is born to “prepare the way” for the Christ. Teresa, meanwhile, prepares the way, unwittingly, for Clare. Christ is the ultimate fulfillment of the law and the central figure of the Bible. 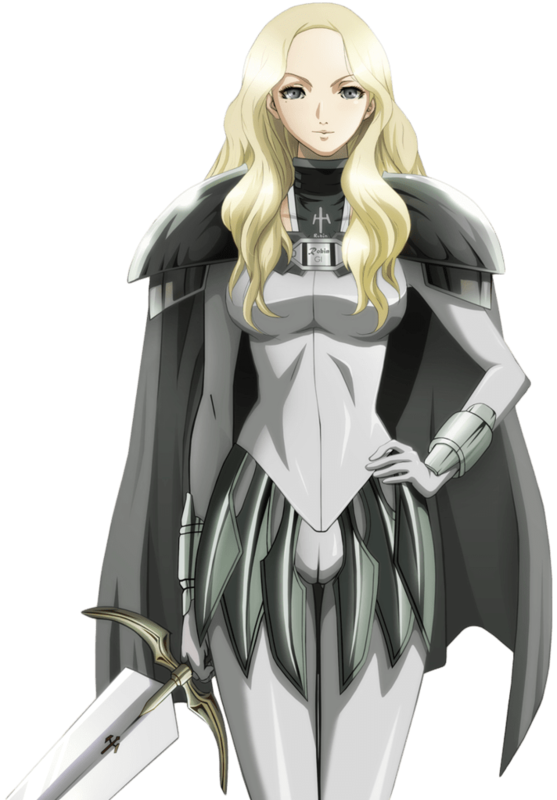 Clare, certainly, is the heroine of Claymore, and as her power and abilities grow (or rather unveil themselves), the manga is setting the stage for her possible role as the claymore that will change everything. Teresa is clearly the most powerful claymore of her time, and even in the present time, there may be none, claymore or otherwise, to match her power. The Bible states that John the Baptist was the most important prophet; in fact, he is the most important person ever born until Christ. Their roles as forerunners and the significance of their roles is weighty. Finally, a more physical and less analytical commonality connects the two. [Spoilers begin here]. Teresa and John share very similar deaths, both by decapitation. Teresa’s is sudden and shocking, as she opens herself up to a death that should’ve never happened at the hands of Priscilla, who becomes a main antagonist of the series. John is killed by one of the Bible’s most vile men, Herod. [Spoilers end here]. Claymore is abound in characters, settings and ideas that aren’t Christian, but which can evoke symbols and themes of Christianity. Perhaps none is more prevalent than the similarities between the greatest claymore and the greatest man born to earthly parents. I look forward to your future posts. I’ll probably learn more about Christianity than I will about anime in the process (never cracked a bible nor stepped into a church service before) but either way it’ll be interesting. Interesting. I am most fascinated by the similarity of Teresa and John’s death. I never realize that connection. Nevertheless, aside from the said similarity, Teresa and Clare’s relationship is quite universal. A mentor/trainer/guardian who set the path for the protagonist is a rather generic and common them in action/adventure stories. You’re right – Teresa and Clare’s relationship is very common, to anime and other works (and in real life). I started with the most obvious connection, however, and each connection, obvious or not, just adds further layers. Wow that is soo cool! Do you believe that there is a connection to Phantom Miria and the Bible perhaps? It might be a stretch (even with my imagination) to make connections between the other claymore and biblical figures, not counting the most major characters in the series. But perhaps Miria can represent someone! I need to catch myself up on the manga, and perhaps think about other connections. Oh, thanks for reminding me! At first glance, the parallel seems to be an anti-Christian one, of angels rebelling against God, like the devil and his demons. Of course, that poses a problem since Miria and the others are our heroes. There’s no problem. It is the Organization that is truly evil. Therefore there is no relationship between the Oranization and Heaven or Miria and the devil. You can say that Miria was sent by God to destroy an evil organization that have murdered thousands of humans for generations. And we know what the sentence is for killing humans is. The sentence is death. I like your website here. The subject matter interests me. In movies I usually spot the Christian template that directors and screenplay writers put into their movies. Even though they may not like Christians very much, it doesn’t seem to stop them from using the life of Christ for their plot lines. When you know what they’re doing, it’s not that intertaining for me. It’s always better when it’s done with sublety. And I’m not into comic books either. I don’t get it, the whole superhero craze. I don’t like manga either, but I enjoy the Claymore series very much. First watched the animated videos, now I read the Claymore manga. It was great at first reading all those chapters all at once. Now I have to wait for one little chapter once a month. It’s a type of torture. But back to the subject matter. In the animation in the snow covered town of Pieta, a sad place where many claymores died, we see a copy of Michelangelo’s Pieta statue in the background. So I thought the Claymore series was taking place in an alternative Europian location. But in the manga, the Pieta statue is not there. Later, I learn in the manga that the location is not Europe or an altenative-universe Europe but a completely different world where Christianity may not be known at all. Still, the symbols are there, the unique cross like symbols that the claymores wear on their clothing and have on their swords. On the church or cathedral in the holy city of Rabona, there is a round shaped window with a symbol of a cross on it. But the priests have different symbols on their robes. Galatea, I think her name is, becomes or pretends to be a nun. Later, she tells Miria, before she goes off on her one woman mission, that she does not believe in God but that she will pray for Miria. The Claymores were not taught religion or brought up to believe in God by the Organization so they, the Organzation, could control the Claymores more completely. and she also prays to an invisible God. I’m glad Chloey commented in reply to yours, because I totally missed it the first time around. Thanks for the long and thoughtful commentary, Mario! Yes, you’re right – there are a lot of symbols in Claymore, both in the anime and the manga. Because of these symbols, the locales, and the ethereal look of the warriors, the series carries a religious tone, surprising because of the level of violence. But then again, the tone fits well when we examine the themes of camaraderie, self-sacrifice, and love, as in the Galatea example you mentioned. *is nodding* Yep, no matter which way you look at it Claymore seems to have a lot of “hiden” elements that link back to the Bible…I wonder why that is??? It could be intentional, though I’d be very surprised to find out so. More likely, it just makes sense that the epic story of man’s redemption finds a counterpart in man’s attempt to tell powerful stories – very much like how Jesus spoke in parables. That makes sense. I wonder what will happen in the next chapter? It’s hard to call. really. You remind me that I’m now behind a month or two…I’m always falling behind with manga!